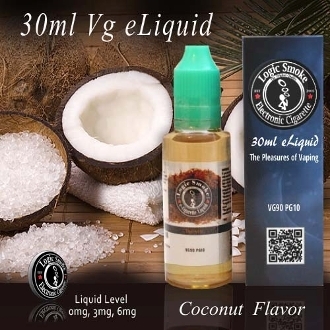 Step into paradise with the tropical enjoyment of Logic Smoke coconut flavored e-liquid! The taste and aroma of freshly grated, tender coconut will set your mind off to the islands. This versatile e-liquid is wonderful by itself and also makes a great mixer for many of our other Logic Smoke flavors. Mix it up! Make your own pina colada by adding it to pineapple. Or make our Logic Smoke Pina Colada flavor even more coco-nutty to suit your taste. Mix it with Chocolate Cream or White Chocolate for that mid-day chocolate craving, with a tropical twist. Add it to cheesecake e-liquid for the comforting taste of coconut custard pie. Head off to the tropics by adding Logic Smoke coconut flavored e-liquid to just about any of our fruit flavors. Don't be shy! Give it a try and enjoy!